Park Elementary staff members wearing their hall of fame t-shirts. 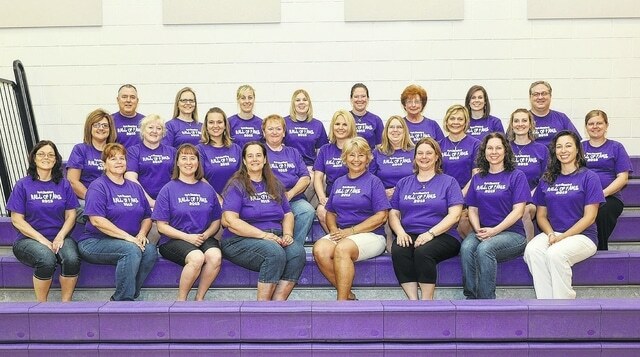 The Ohio Association of Elementary School Administrators recently announced that Park Elementary in the Swanton Local School District has been selected as a 2015 Hall of Fame School. Principal Paulette Baz and her staff will be presented with the award, including $1,000 to be used at the principal’s discretion. The OAESA will recognize 10 winners of the Hall of Fame Award during an Awards Luncheon to be held June 12, at the Hilton Columbus at Easton. The Hall of Fame School award recognizes schools that go above and beyond the call of duty to get students, teachers, and community members excited about education. The school staff submitted an extensive application documenting the quality of their educational program in the following areas: instructional system, student achievement, student development, personnel, administration, school management, and stakeholders. Located in Columbus, the Ohio Association of Elementary School Administrators serves Ohio’s pre-K, elementary, middle level, and central office administrators by providing professional development, legal consultation, professional publications and networking opportunities.